Welcome to Palestine Today, a service of the International Middle East Media Center, www.imemc.org, for Thursday, January, 12, 2017. Israeli troops kidnap civilians from the West Bank and open fire at Gaza farmlands. These stories, and more, coming up, stay tuned. Several Israeli military vehicles invaded, on Thursday at dawn, Barta’a town, southwest of Jenin in the northern part of the occupied West Bank, and demolished a coop, in addition to handing warrants for the destruction of another coop, and an industrial structure. Tawfiq Kabaha, a member of the Barta’a Local Council, said that Barta’a has been subject to extensive invasions and searches of homes, and suffered many demolitions of homes and property over the last several years, in addition to being isolated by the Annexation Wall, and illegal Israeli colonies. Elsewhere, Israeli soldiers abducted, earlier on Thursday morning, three Palestinian men at a number of military roadblocks, in the southern part of the occupied West Bank, and also stormed and searched many homes. The soldiers also installed a roadblock at the main entrance of the ath-Thaheriyya town, south of Hebron, stopped and searched dozens of cars, searched them and abducted one Palestinian. In other news, in Gaza, Israeli soldiers stationed on military towers across the border fence, near Erez terminal, in the northern part of the besieged coastal region, fired many live rounds at homes and lands, close to the border fence. Damage was reported but no injuries. 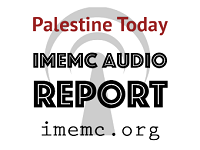 And that’s all for today from the IMEMC News; this was the Thursday, January, 12, 2017, news round-up from the Occupied Palestinian Territories. From more news and updates, please visit our website at www.imemc.org Today’s report has been brought to you by George Rishmawi and me Ghassan Bannoura.